After two days of hacking, I have made some significant progress! We have a super early alpha preview in development version of GTK3 Pinta, in which everything works except for minor stuff like toolbars, effects, addins, and the canvas. 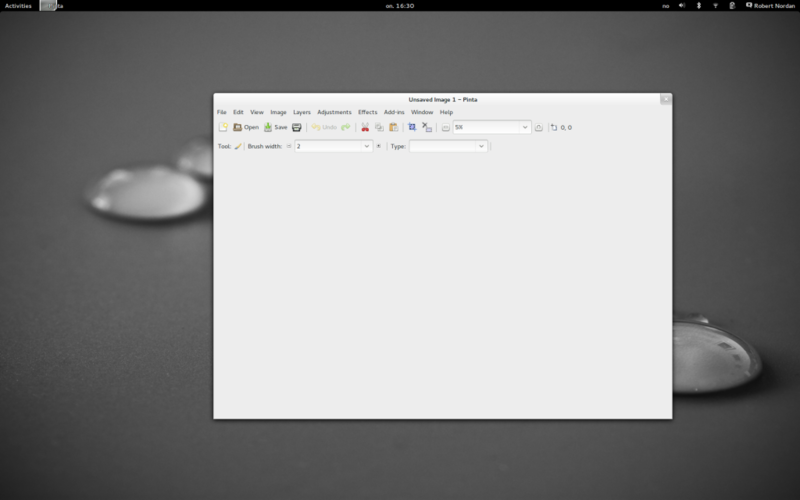 There are four major pain points: One is that we use Mono.Addins.GUI for managing add-ins and that is still GTK2. The second is that we have a lot of advanced dockable, resizable widgets loaned from Monodevelop and lots of Stetic-generated UI, that are not very straightforward to translate to GTK3. The third is that the GDK drawing APIs are the one thing in GTK that has been changed the most and had the most stuff removed, and being a drawing program we depend a lot on this. Finally, the GTK Ruler widget has been removed completely from GTK, which complicates things for us since we will have to create a custom one. So today I will probably focus on other stuff. Stephen Shaw and myself are both interested in Mono.Addins, so together with Andrea Gaita we will be looking into GTK#3-ising it so we’ll have building blocks in place. Also, since GNOME recently reorganised live.gnome.org to wiki.gnome.org, all of Tomboy’s wiki pages are borked and need fixing so I’ll do that. I’m also considering looking into seeing what Tomboy needs for GTK#3, since it has a lot less advanced UI. The internet does not have corners, yet this one is mine.